Just a quick update folks, we have just been to the cardiologist where he is happy with how Roy is tracking and just wants him to continue on meds and he will see him again in three weeks time. By then he will have discussed with the Urologist the pros and cons of the various types of surgery and options from his perspective and we can move on from there. It looks as though the Atrial Fibrillation may have been around for longer than we knew about it and is probably something that Roy will have forever but hopefully it will be kept under control by medication. It is just getting the balance right, and fingers crossed it appears to be under control now. This hiccup is well and truly behind us, and we can move on with more positive things. 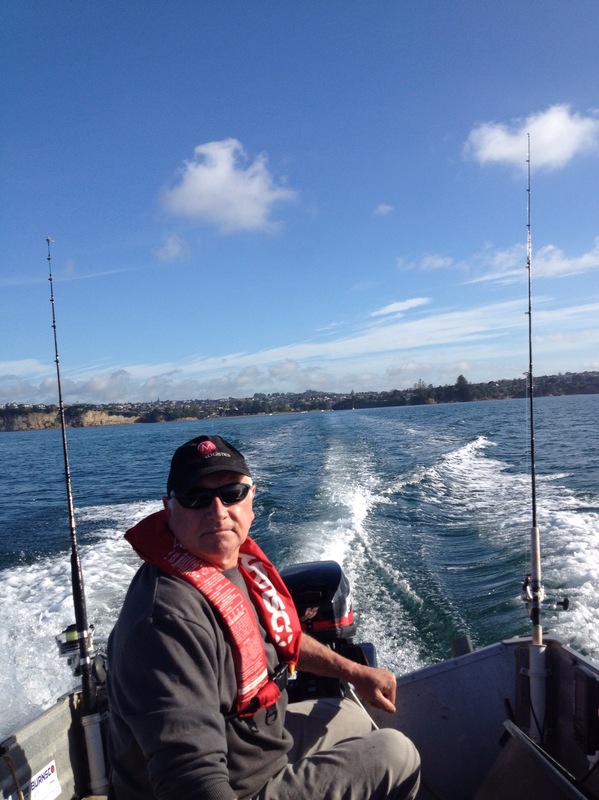 Last weekend I snuck out for a few hours of fishing with Steve in his boat. It was a glorious day. 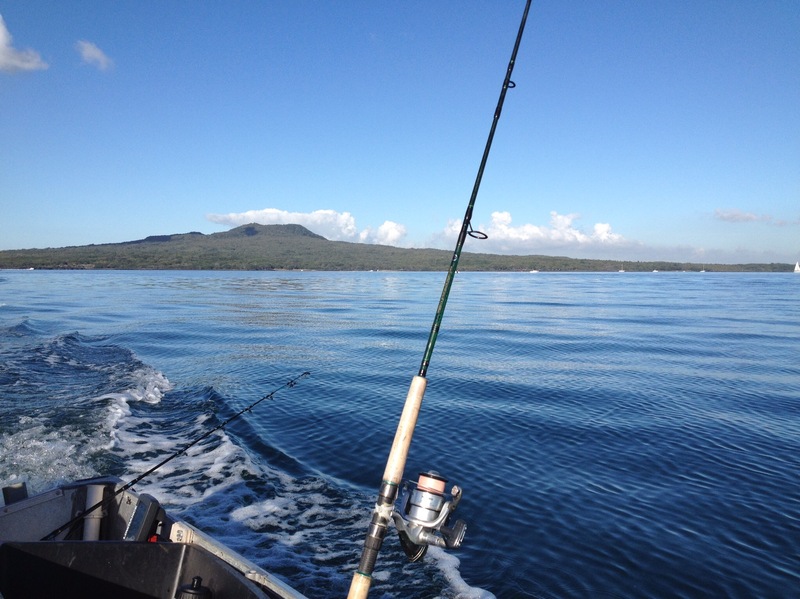 You may be able to see the Auckland Sky Tower in the background, with Rangitoto lighthouse on the left. Life can now return to some semblance of normality as we head back to the van tomorrow -Sunday. Into the car we get, luckily I remember that there is a White Cross Clinic just along the road, probably less than a kilometre away. With hazard lights flashing, I overtake the long queue of traffic banked up from the lights (yes, it’s just after the 3o’clock school rush) and drive the last 100metres along the wrong side of the road and into the car park at the A&E. We get Roy inside and they immediately spring into action, taking him straight into an emergency room, hooking him up to an ECG where I can see that his heart is racing and blood pressure is very high, the Doctor looks at all the readouts, listens to his history and what’s been happenening over the past few days and says he’s calling an ambulance. The ambulance arrives, Roy is loaded aboard and I’m in the passenger seat in the back with one of the ambulance crew. They professionally go about their work quietly and efficiently, all the time talking to us whilst we start on our way to the hospital. We strive at North Shore hospital where we are handed over to the lovely staff there. Over the next hour or three or five, tests are done, bloods taken, lines put in, X-rays taken, information is gathered, and yes, you guessed it, he is staying in overnight for observation as they cannot figure out what is going on. By the time Leslie arrived to pick me up, his pain was nearly gone, and he was looking very comfortable. He remained in hospital until later Wednesday afternoon, and the result? Well, your guess is as goood as anyone’s, it could have been a spasm in one of the arteries as a result of the angio, it could have been a reaction to the new meds he had started the previous day, it could have been something as simple indigestion. We are due back to the cardiologist on Friday to see what changes, if any, the new meds have made. 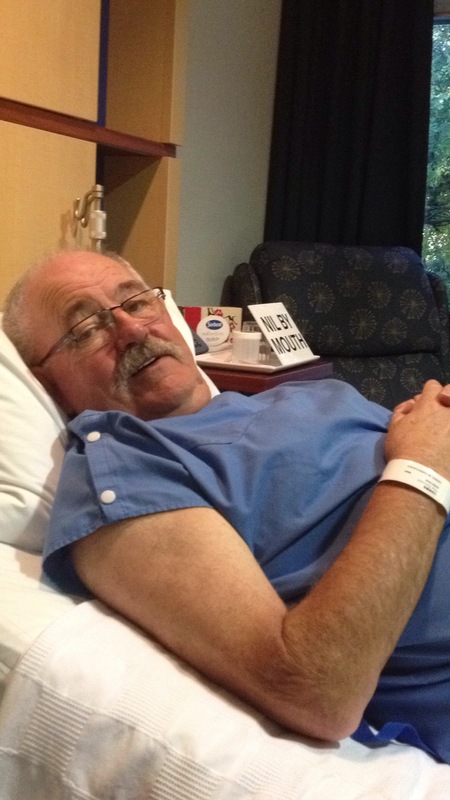 Hopefully the AF is under control and we can then reschedule the prostate surgery and get on with recovery. Fingers crossed. Roy all dressed up with nowhere to go! First the check of the blood pressure, temperature etc and an ECG, and guess what? 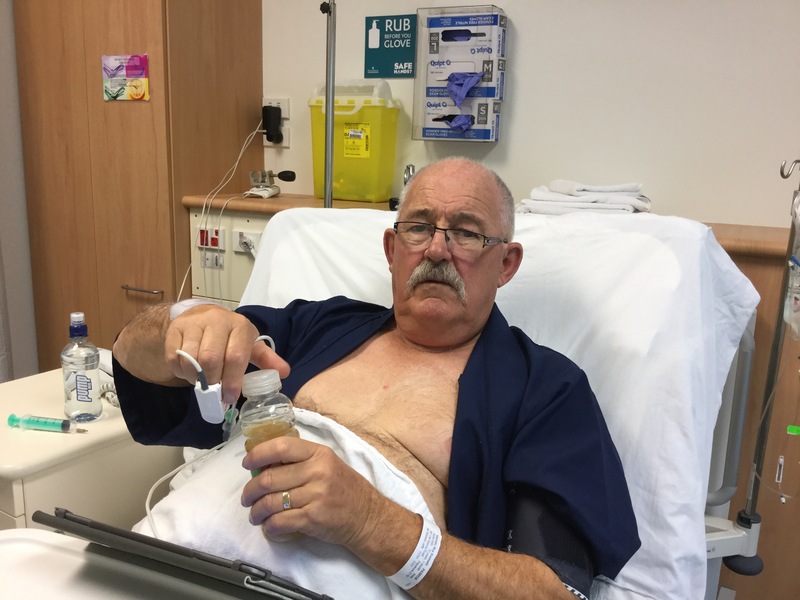 Yes, his heart was back in Atrial Fibrillation …bugger! But still the angiogram is going ahead. Showing off his shaved chest post surgery!! Angiogram done and no stents required but no idea why AF is still in play so a new lot of drugs and another check on Friday. Fingers x. We were up at the crack of dawn, well, to be fair it was even before the crack of dawn. 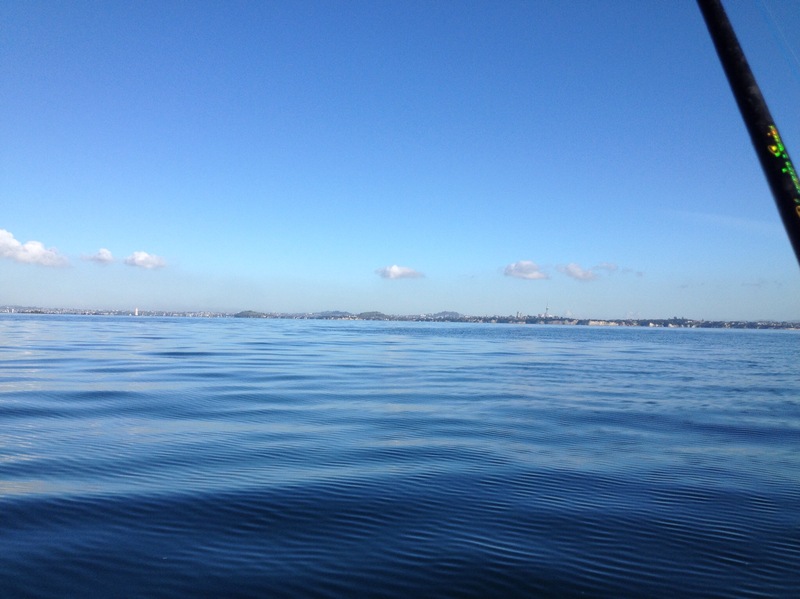 We had to travel across the city from Torbay to Ellerslie for Roy’s appointments as we had to be there by 6.45am and you just never know what the traffic is going to be like. We arrived with plenty ﻿of time to spare. We were quickly escorted into the procedure room where two nurses were waiting to prep Roy ready for the Drs arrival, they do the usual checks; temperature, blood pressure, pulse, a cardiogram, you know the usual, and yes Roy’s blood pressure was very high (for him) as was his heart rate, which is to be expected I suppose. First on the schedule was the T.O.E. (transoesohageal echocardiogram) which is a scope (or should I say a very long, mean looking piece of pipe) shoved down carefully inserted down Roy’s throat so that an internal scan of his heart can be performed to look for any clots particularly in the back of the heart. If there are any clots, then they would not be able to do the next procedure. And yes he would be sedated for the process, but not for the chest shaving that was part of the prep!! When I left to go to the waiting room at 7.20 the anaethestist and specialist had arrived and introduced themselves. 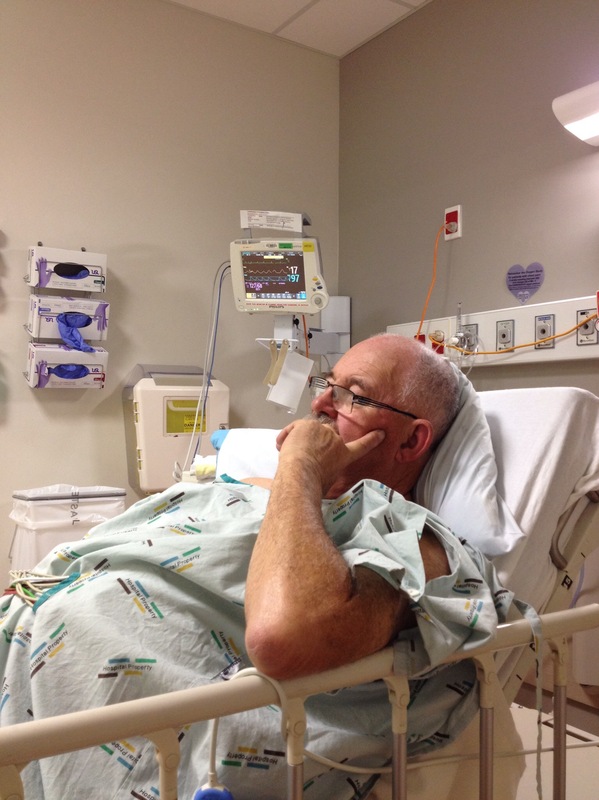 Soon they were starting to put the needles in ready to administer sedation drugs….time for me to exit! By this time Antony had arrived to keep me company. By 7.45 the anaesthetist was out saying it had all gone well and they had not found any clots so they could then go on to do the CV (shock to the heart) with that process being successful with the heart restored back to normal rhythm. The specialist who did the procedures then came out to say all was good and that the cardiologist would see us once Roy was up and about in an hour or two. Which is exactly what happened. Roy came out an hour or so later to join us in the waiting room. They served him a light breakfast, to make sure he could swallow OK, and said to relax as he needed time for everything to settle. We saw the cardiologist later in the morning, who went thru everything from the days tests, and then went on to explain the procedure scheduled for Monday. This will be an angiogram which is used to check to see if the arteries are ok and if necessary they put in stents at that point. The cardiologist did say that Roy’s heart valves and the heart itself appeared ok, so this just the final check to rule out the physical anomalies that can result in Atrial Fibrillation……. otherwise we put it down to the fact that it’s just one of those things that happen. Hopefully this has fixed it, but apparently it can recur in some cases. Once Mondays procedures are done with they will then reschedule the prostate surgery for 4 weeks time. The cardiologist and Urologist have been communicating, and as the cancer is minuscule and it is the size of the prostate that is the real problem, then another 4 weeks to wait is not an issue ﻿and we are still well on schedule for our trip. It started a month or two ago when Roy went for his annual check up with the Urology specialist. Previously he had a hiccup with his kidneys, which you can recap that story here. As part of the checkup the specialist does the usual blood tests, flow tests etc, and he said hmmmmm, Roy, your PSA levels have gone up a bit, lets check things out further. So off he went for an ultrasound scan. The scan showed that his prostate was very enlarged and warranted further investigation. So off for a full MRI to see what is happening. I have to add in here that in between all this Roy also had hearing tests, scans, an auditory MRI, more tests and hearing specialists, as well as eye tests, eye specialists, more visits, laser surgery, checkups. 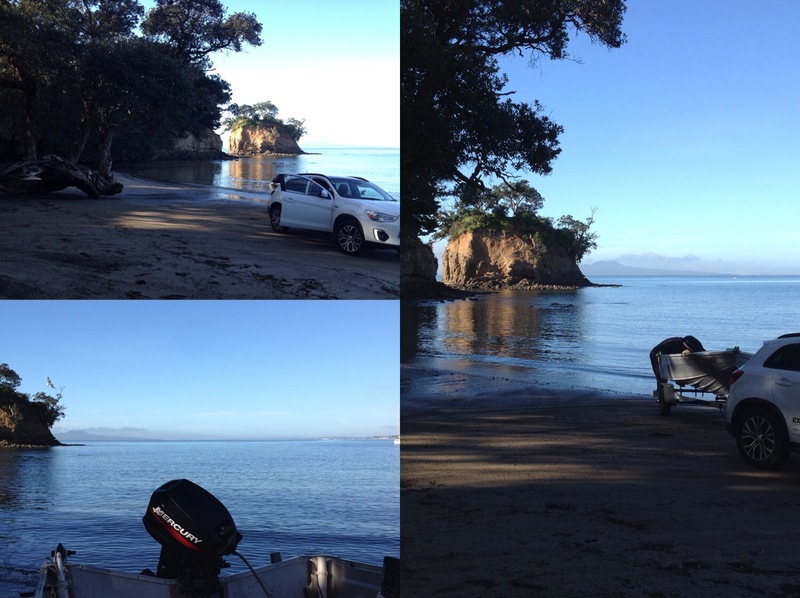 It’s been a busy old time with lots of appointments all around Auckland. Then came the results, he needed a biopsy so we went off to have that done at the specialists. 14 samples were taken for testing. We only had to wait a few days before the results came back, and you hear those dreaded words …”sorry, but you have prostate cancer”. Knock us down with a feather. Regather and press on, we need to discuss options and also get a better idea of what is happening. The next step is to have a Gallium PET scan, which shows if the cancer has spread anywhere else and gives a better idea of what we are dealing with. You can read about this amazing technology here. Up until just over a year ago this scan was only available in Australia and we would have had to go there for one, but Mercy hospital in Auckland now has the only machine in NZ so off we went there for the scan last Thursday. Thank goodness for medical insurance as these things are costly and as well as with all the specialist visits, MRI’s etc over the past few weeks we have had our monies worth from our medical insurance already this year. But back to the tests. We came away from the Gallium PET scan with a copy of the CD and of course we just had to have a look at it ourselves….bad idea…..as we stared intently at the computer screen all we could see was that every organ appeared to be glowing and as far as we could tell things did not look good. However, a bit of googling and research helped alleviate those fears, things were not as bad as what we thought. Best we wait for the experts to fill us in as give us the official report. We were scheduled to get the results the following day on the Friday, however the specialist had been called away for urgent surgery so our appointment was deferred until the following Tuesday. Meanwhile, we had already scheduled a visit to our GP for the Monday. Our doctor has been a very good sounding board and we trust her advice and we wanted to discuss options with her from her perspective, in particular her experience with other patients and their aftercare specifically any problems associated with the different options available. She had the results from the PET scan and could finally put our minds to rest and tell us that Roy was all OK, apart from a very small spot of cancer in the prostate, obviously caught very early. Phew. Well that’s a relief. We came away from our GP armed with lots of good questions for the Urologist. The folllowing day, Tuesday, we went off to the Urologist where he confirmed that there is indeed a small bit of cancer in one part of the prostate BUT the size of the prostate was more of an issue at more than twice the normal size. What was good news was that the cancer is completely contained within the prostate AND the PET scan showed that apart from that he is all good. I could bore you all here with the details of all of the various options for the next step i.e. do nothing, have radiotherapy, have radioactive seeds implanted or have surgery, all of which have their individual pros and cons but I will spare you all the details of each. However, if anyone wishes to know the ins and outs then give us a call. The best and only real option for Roy is to have the prostate removed which will be done on Thursday 8th June. Again, thank goodness for medical insurance as things wouldn’t have been happening this quickly I am sure. The surgery will be done via Robotic Keyhole Surgery. We rock up to Southern Cross Hospital yesterday morning at some ungodly hour ready for surgery. Roy is prepped and tested and is soon ready to be wheeled off to theatre as he is first on the list. all ready to go! I head off to get some breakfast and to do some shopping as he is scheduled to be in theatre for 4 hours. However, I soon get a phone call from the anaesthetist saying that they will not be operating today as they found a bit of an irregular heartbeat so they need us to get that sorted. Knock me over with a feather. So back I go to pick him up. By the time I get there they have arranged a cardiologist to see him over at Ascot Hospital, so we head straight on over. We are there by 10am. Next comes a barrage of tests, upshot? Roy has Atrial Fibrulation which mean his heart beats irregularly and needs to be sorted as the consequences could be dire. By midday we leave the cardiologist with our heads reeling full of information and with more appointments scheduled. Next week he will be going in for a CV and a TOE. What do these mean? Well a CV is a Cardio Version which restores the heart to its natural rhythm by shocking it, and a TOE is a transoesohageal echocardiogram whereby a fibre optic tube will be position in the osophegus allowing an ultrasound of the heart. All will be done under sedation. 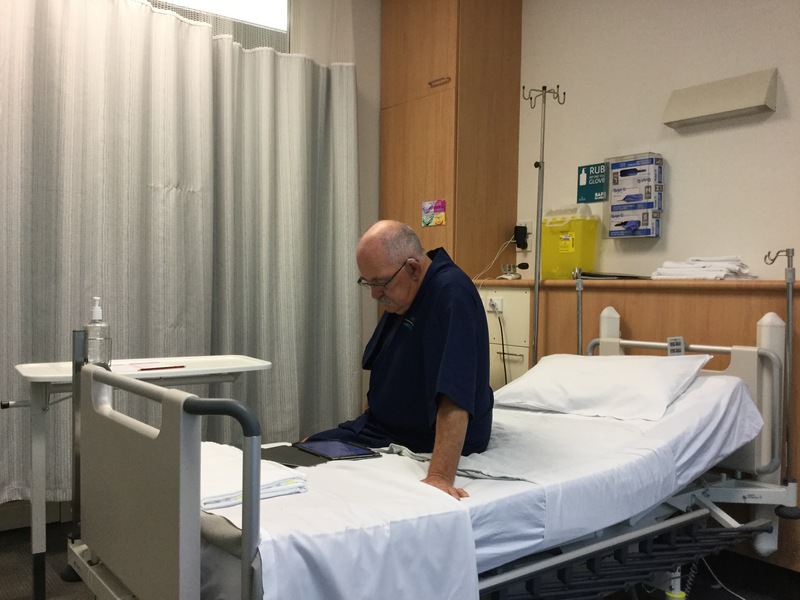 The following week he is booked in for an angiogram depending on the results from the previous two procedures will determine what is to be done. So the next step is to get this sorted, then they will reschedule the prostate surgery and we can then look forward to our trip to the UK & Europe in September. Stay tuned for the next exciting instalment.